Mr. Ravinder Kumar founded Sukriti Design Engineer & Consultant in the year 2010. At that time, the company started operating in a small tool room and fabricated wire rings, to be fitted in wheel covers of cars. Based in Gurgaon, Haryana (India), the Manufacturer and Supplier steadily grew in terms of its production capacity, infrastructure and sales. 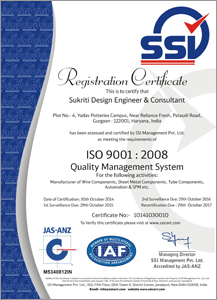 Due to its latest production techniques and maintaining quality standards, the company received ISO 9001:2008 certificate. And, due to its ethical business practices, it also started getting orders from international buyers. In the financial year 2012-13, the company recorded an annual turnover of Rs 1.5 crores, which has grown tremendously to Rs. 5.8 crores in 2014-15. The products it manufactures include Wheel Cover Wire Ring, Wire Components, Medium Wheel Ring, Custom Round Wire Rings, Steel Wire Ring and more. To cater to the unique demands of clients, we also provide customization solution. We make products according to the specifications provided by them. Whether they want to change the grade of material, design, style, capacity, size, shape, finish or color; we can incorporate the changes in the standard range. As an ISO 9001:2008 certified company, it follows all the regulations during manufacturing our range. Thus, the clients can be assured that the products are developed in lines with the internationally accepted standards. Our personnel check few of the products produced in the batch and only when the sample passes these tests, the complete batch is approved. The jigs and fixtures created undergo light testing LH and leakage testing RH.